So....this morning some bees from our beehive (or from somewhere else...though unlikely) swarmed into a bush in our frontyard. My husband saw it when he got home from church and was able to get it into our second, empty hive. This photo below is the result. Thankfully they've all stayed inside for the most part. 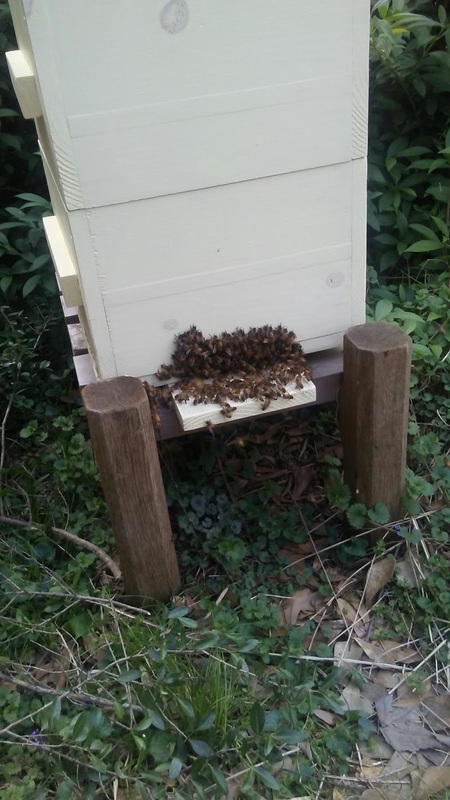 He dropped the main swarm into the hive and cut branches off the bush with the remainder of the clumps of bees onto the ground in front of it. Several bees made a 'human-like' bridge they walked up from the ground to the opening in the hive. Amazing. Have been sitting out there just watching them. It appears they all stuck around. Working, working, working. About a month ago, they swarmed into a next door neighbor's holly, way up high, in an reachable spot. 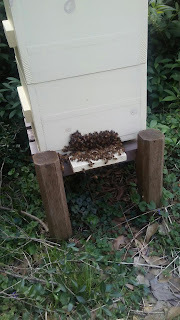 My husband moved some bars over in the original hive, and they up and returned. Guess today they had some new queen action. This is the perfect Easter gift. And no bee stings. Oddly enough, he never wears protection. No smoke. Just calmly works with them. It's said bees know their masters. I like to think so.